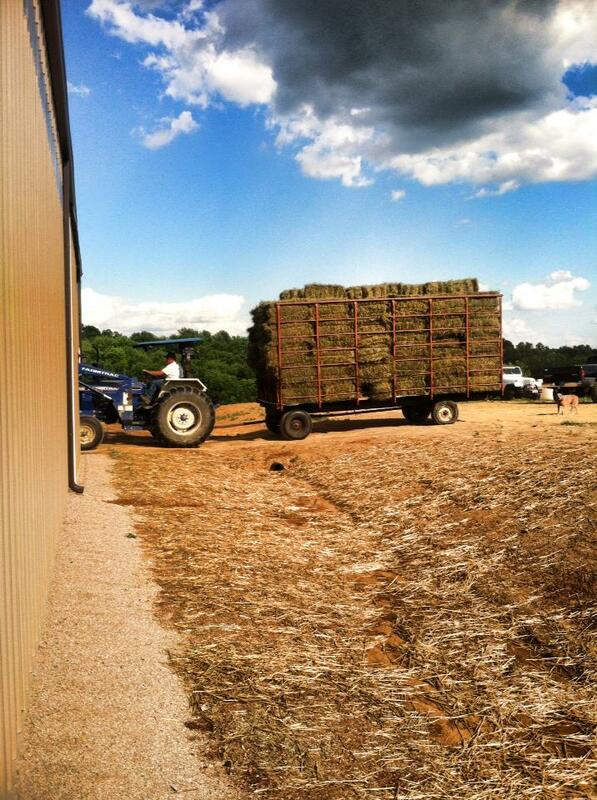 Hay: We go through about 4,000 bales of hay each year. Many of the horses that we save are underweight and malnourished when they come to us, and high quality hay is always needed. That being said, we also get some FAT horses in that need to lose weight, so even lower quality "diet" hay is welcomed as well! Round Pen Panels: Making temporary pens is very important since we get in many different horses. Quarantine is made easier the more "far away" pens we have, and being able to move some round pen panels is a way we can ensure we don't spread germs. Also, we would love to have an outdoor arena for people to try horses! Railroad Ties, Stones, Building Materials: We are in the process of saving up materials for our large outdoor horse obstacle course! This course will allow us to take our training to the next level as we help these horses become fearless trail mounts, mounted patrol horses, or superheroes! When put up for adoption, we can then showcase our horses' special talents... making them more attractive to potential adopters! Gravel/Lime: With horse trailers constantly coming and going, we are always needing to "manicure" our driveways and paths. Gateways are a magnet for mud, so putting crushed limestone down eliminates the problem! Contact us for information on how to donate a load! It's easier than you think... make a phone call, pay over the phone, and they deliver it right here! Horse Tack and Supplies: Buckets, bridles, saddles, oh my! We have a variety of horses that come in a variety of shapes! Having correctly fitting tack is an absolute MUST when teaching these horses that humans are actually nice. We will take ALL new or used tack (dirty, clean, old, we don't care!). Sometimes our adopters like to have the bridle that we fitted to the horse while it was here, which means that the horse doesn't have to deal with another change. If you donate your equipment, then we can make that happen for that horse, and the tack you aren't using can make a difference! Anything we wouldn't use here we can sell to raise funding for the animals. A horse named Sizzle was purchased using funds raised from selling used tack. Clean out your tack room, save a life! We are hoping to have an online store on this website soon to help raise money for our auction fund! 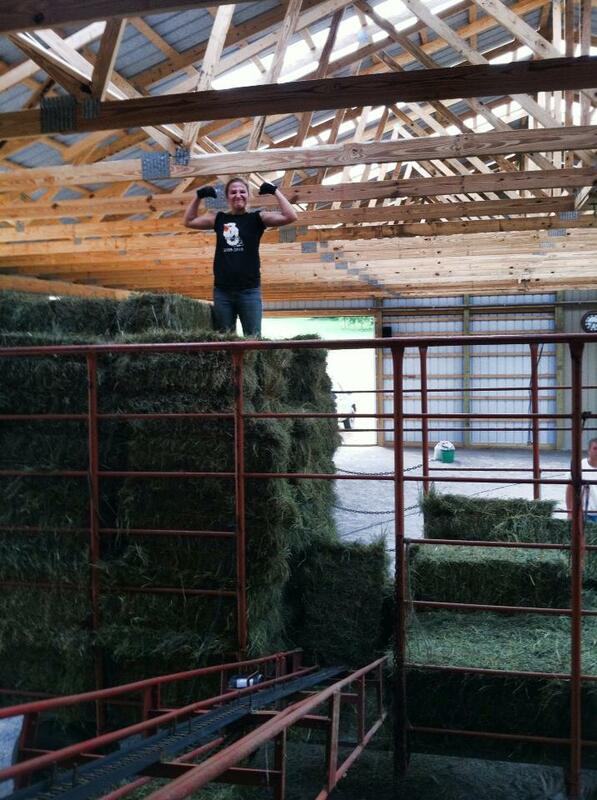 Supplements/Grain: We go through a bunch of supplements and grain when rehabilitating horses! Ulcer and gut supplements are the most popular, but we also need hoof and fat supplements as well. Some of our favorites include Daily Gold, EquiPride, Uckele GUT, Farrier's Formula, and Cool Calories. We will use ANY supplements (even expired) and always have horses in need! The same goes for grain. Any and all feed donations are appreciated! 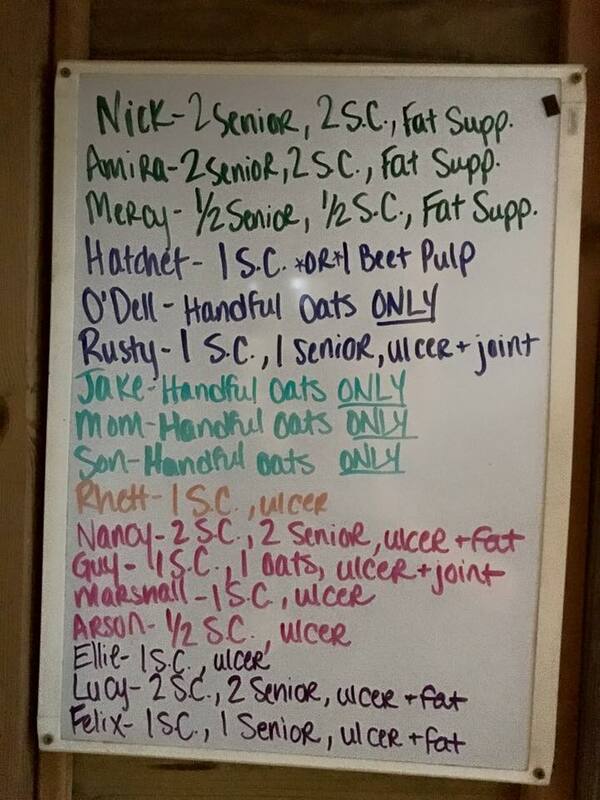 You can call in a grain order to our local feed store. Their number is 740 589 6000. You can buy a bag of grain (any brand, any type) over the phone and just tell them that it is for Bella Run Equine! Shoot us a message letting us know and we will pick it up! Dog Collars/Leashes/Toys: When we pull a dog, all they come with is a paper collar with their ID number on it. When they leave us, we like to send them with a collar (large sizes are most needed), a leash, and a few toys. Some of our dogs have never had toys before, and we like to provide a variety for training and entertainment purposes. A mentally stimulated dog is a well behaved dog that someone might like to adopt! Dog Beds: After a long day on the farm, the dogs in our program come inside and crash on their beds. When adopted out, we like to send their beds with them so they have a familiar spot in their new home. We are always in need of new dog beds (or gently used beds that can be put in the washing machine) to send with our pups when they leave! Medical Supplies: Some of our horses and dogs come in with injuries and wounds. Being able to treat many of these on-site is great, and being prepared with all of the necessary supplies is even better! Any and all medical supplies are greatly appreciated. Needles and syringes are very expensive, and when a vet prescribes an injectable medication, it helps save money if we don't have to purchase the needles and syringes. Anything we do not use here will be sent to another local non-profit that can use it. Gift Cards: The auction is 2.5 hours away for us, so gift cards for fuel are an excellent way to help us get there! Also, gift cards to grocery stores (Kroger, Walmart, etc.) or home improvement stores (like Lowes) will also help us buy things that the horses need right now! Trees: Donate a tree in honor or memory of someone, and know that it is making a difference here at Bella Run! This may seem like a funny thing to have on our wish list, but Bella Run doesn't have many trees in the pastures. We will protect the trees from nibbling ponies, and the end result will be a beautiful way to help our earth and horses. We have run-in sheds, but we would love to be able to provide our horses with more natural shade. Planting trees is also a great thing for the planet, so why not? Rubber Mats: Mud at gates, bathing areas, and water tanks is not fun. Placing rubber mats in high traffic areas is an easy way to protect our ground and prevent further issues/injuries that mud can potentially create. Water Tanks: Bringing in new horses constantly means that quarantine is important for herd health. Having separate water is number one. Any size tank can be utilized here, new or used! Arena Footing: We are very thankful to have a small indoor place to ride (56'x72x'). We currently do not have any footing and are riding on the hard base. A couple dump trucks of nice footing to add would be so wonderful! 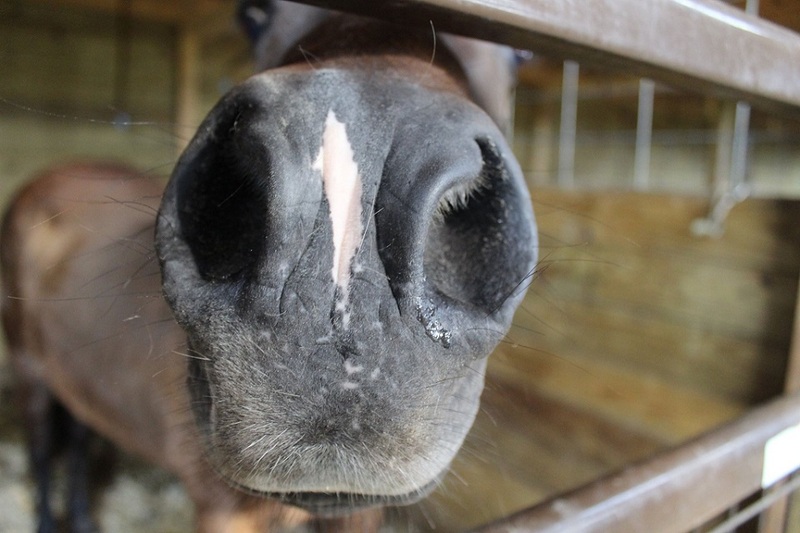 Dewormer and Fly Spray: Parasite control is a big part of getting our horses healthy. While flies are painful and irritating, internal parasites (worms) can cause a whole slew of issues! We are very grateful for any dewormer! Run-In Shelters: We see portable 3-sided shelters around, and know that someone may have one that they arent using anymore. Having more shelters would mean tht we could house more horses here at the farm. If you would like to sponsor the bulding of a permanent run-in shelter here at the farm. ($1800-$2400)depending on size), please contact us! You will receive your name on a plaque at the entryway of the shelter to thank you! Slow-Feed Hay Bags: Feeding our horses from slow feed hay bags keep them healthier (they can "graze" all day instead of eating for a couple hours then standing), eliminates waste, prevents mud, and greatlly reduces food aggression. We would love to have all of our horses eating out of hay bags 24/7. Slow feed bags are preferred so hooves can't get caught. HayChix has donated hay bags in the past and we LOVE them (www.haychix.com) but are grateful for ANY type! Tack Store Gift Certificates: Horse equipment is expensive, and since we see a variety of shapes and sizes here, we need a lot of different sizes and styles on hand. Gift certificates to online tack shops like Big Dees, Chicks, SmartPak, Jeffers, and State Line Tack, and others would allow us to get the equipment that we need! Commercial Grade High-Capacity Washing Machine: Horse laundry is ruining our personal washing machines, and frankly, they are not even doing the job well. Laundromats in the area have blacklisted all horse blankets, and pressure washing simply doesn't get the deep dirt out. If you know of a laundromat that's going out of business, or are interested in donating a big boss washing machine, please contact us! 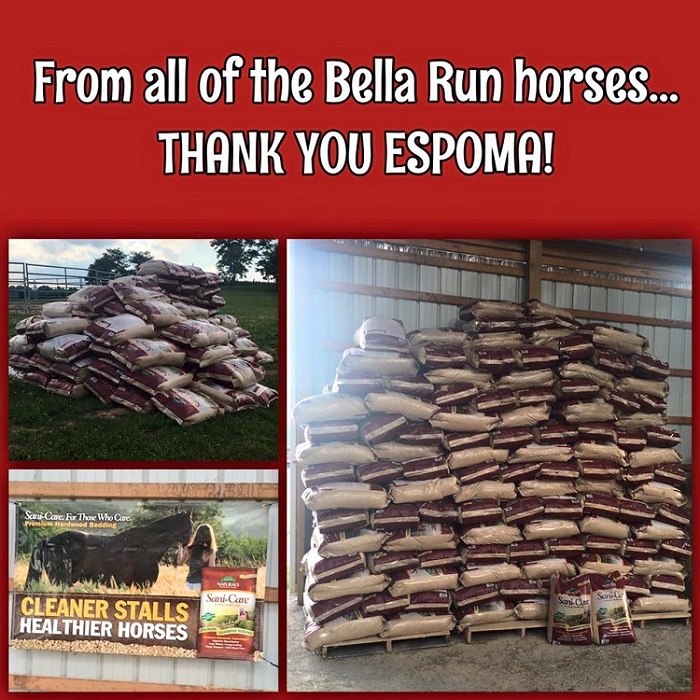 We are proudly sponsored by Espoma, who provides us with WONDERFUL bedding for our trailers and stalls! Sani-Care is a great product and we are very fortunate to be able to have it for our horses (www.sanicare.com). We just want you to know that if you are shopping for us, you can skip the shavings aisle and pick up a different item on our list! Thank you!